Samsung announced that it will launch Wemogee, a communication tool for individuals with language disorders, on Android April 28. The application was designed to allow users with aphasia and other language disorders to communicate with others. Aphasia is a language disorder caused by brain damage, which affects a person’s ability to understand or express speech. 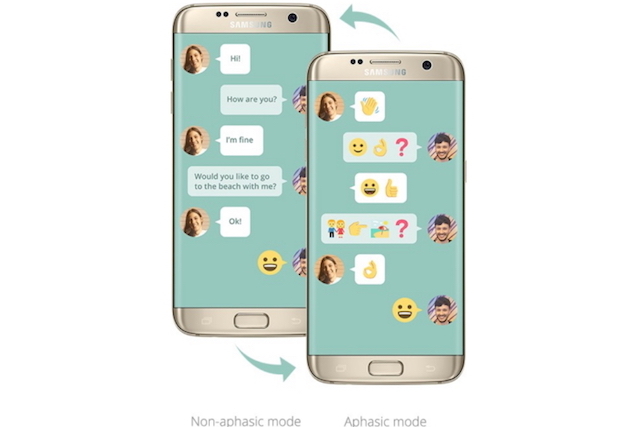 According to Samsung, recent studies have shown that emoji can help people with disorders like aphasia express themselves. With this in mind, the Wemogee app serves as a “translator” between emoji and text, and contains a library of more than 140 phrases related to major themes. Specifically, phrases are split into six main categories: everyday life; eating and drinking; feelings; help; recreational activities; and anniversaries and celebrations. Through a simple and intuitive interface, aphasic patients identify what they want to communicate through a panel of visual options, sending the chosen sequence of emojis to the non-aphasic recipient. The non-aphasic user will receive the message in text form and can then reply using preset textual phrases. Wemogee also works as a home practicing tool, enhancing the effectiveness of traditional rehabilitation treatment of aphasia. Aphasic patients understand emojis because they depict all aspects of emotions. The use of gestures, images and facial expressions is a function perfectly preserved in understanding and often also in the production of language. A preset list of well-defined phrases that refer to the most immediate needs of the individual is essential. The Wemogee app will launch on Google Play April 28. The app will support both English and Italian languages.